Remembering Floyd D. loop, M.D. My thoughts did not fit. Death is inevitable, I cried. When the news reached us on Jun 12, 2015, from Dr. Floyd Loop's daughter: "I am writing to let you know that Dad passed peacefully last night surrounded by family", both my wife Rachel and I were shocked and saddened with that news. We knew he was ill and under intensive therapy, but we did not expect his death so sudden and so soon. We felt very sad for losing a good friend and famous colleague in cardiovascular medicine, Dr. Floyd D. Loop, former Chief Executive of the Cleveland Clinic Foundation (CCF), a distinguished cardiothoracic surgeon and an accomplished leader in the field. We decided to share with Heart Views readers, in brief, our feelings about Dr. Loop. I write about him as a person and a friend while Rachel will write about his career. 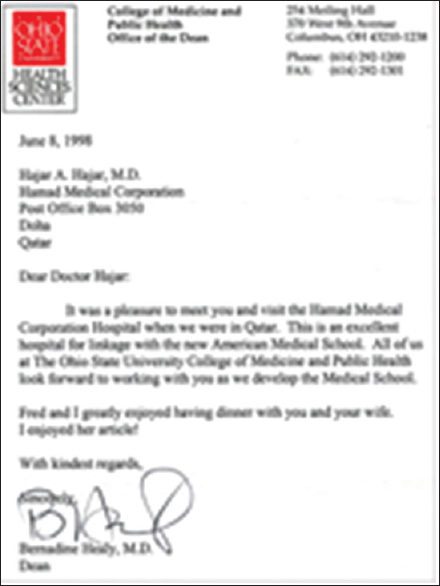 The first time I met Dr. Loop was in August 1997 when I accompanied HH Shaikh Hamad Bin Khalifa Althani, the Amir of the state of Qatar, on his visit to the CCF in Cleveland, Ohio. HH had a kidney transplant in CCF during that visit, and I was his personal physician and a friend. Dr. Loop explained to me the concept and the historical background of CCF as non-profit institution. That visit was the beginning of a fruitful relation between us as individuals and between our two institutions, CCF where Dr. Loop was chief executive officer (CEO) and Hamad Medical Corporation (HMC) when I was its CEO. Sometime later Dr. Loop and his well-known wife, the cardiologist, the dean of College of Medicine, Ohio State University and former National Institutes of Health Director Bernadine Healy, M.D., stopped by in Qatar on their way from Abu Dhabi. I took them to our hospital for a tour and listened to their advices. I forgot the date of their visit but Dr. Healy's letter to me was a good reminder [Figure 1]. On my request Dr. Loop sent a team from CCF to visit HMC and submitted recommendations to improve our services. He shipped to us as gifts, boxes of films and pamphlets, for patient education produced by CCF. I knew Dr. Loop as a kind and very humble gentleman. He told me once when I called him "Dr. Loop": "Hajar!.. call me Fred". His humbleness probably came from his simple childhood. He was the son of a country doctor in Lafayette, Indiana. Seeing his father examining and treating patients had a positive impact on his choice for a future career. As a young boy Floyd accompanied his father when he made rounds on the rural farms. He helped carrying his father's black bag. Floyd admired the country doctor's life. "I interacted with a lot of patients and I saw their appreciation and the gratification my father received," he recalled seven decades later. Loop said that he once imagined himself as a civil engineer, but that career path was "always a distant second." His father's experience was instructive — and seductive. Nevertheless, the boy clutching his country doctor father's black bag, dreaming of a life of bucolic medicine — "delivering babies, fixing hernias, making house calls" — got a little sidetracked. "Those were good days, and they gave me some incentive," Loop says. That country side boy became not just a doctor, but a pioneer cardiac surgeon who is credited for leading the CCF to its national and international prominence. In this brief about my friend Dr. Loop, I cannot skip mentioning his very long relation with CCF where I met him and where he worked for 34 years. Actually his association with the clinic continued after his retirement in 2004 for 10 years more. This association of a leader to his institution in USA after retirement, is very admirable. In contrast to that, in the Arab world, such a founder or a leader becomes irrelevant. There comes a complete divorce between the founding leaders of institutions and those who replace him after stepping down, retirement or changed. His advice or suggestions will not be appreciated or tolerated. 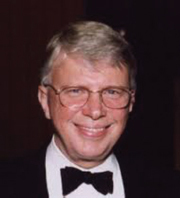 But for Dr. Loop, after his retirement in 2004, he continued to advise, mentor and chaired or served on numerous private and public corporate boards for CCF. Dr. Loop joined Cleveland Clinic as a cardiac surgeon in 1970. He became chair of the Department of Thoracic and Cardiovascular Surgery in 1975, a post he held until 1989 when he was named CEO of the Cleveland Clinic and chair, for Board of Governors. During his tenure, Dr. Loop grew the Clinic to 12 hospitals and 14 family health centers. He also is credited with launching the new heart hospital that became affiliated with the CCF. "Under his leadership, the Cleveland Clinic rose to be ranked consistently in the 10 top hospitals in the United States. Loop was named one of 30 persons who made the greatest contributions to Cleveland in the past 30 years". 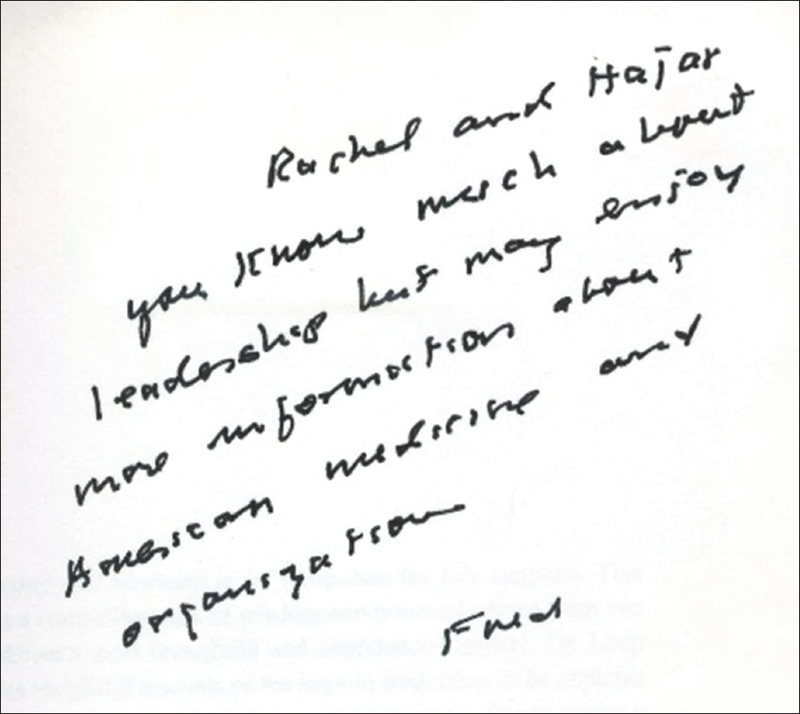 In 2009, he published a valuable book, titled Leadership and Medicine. He sent me a copy and wrote on The first page a hand written note [Figure 2] and added a letter [Figure 3]. Last year I wrote him saying that I started to think about retirement. 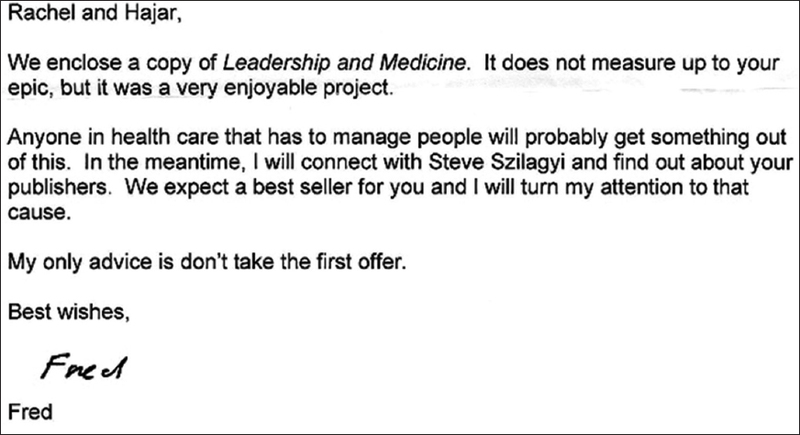 He quickly replied advising me against considering retirement yet. I thought that he stepped down from CCF management to rest and enjoy travel, but unfortunately, not too long after retirement, his wife fell ill, suffering from head tumor for several years and died in Aug 2011. Over the last 18 years both I and Rachel were in touch with Dr. Loop. Rachel used to write him often about life in Qatar. He admired her stories and convinced her to put all her writing in a book about Qatar. In fact it was he who arranged for her the printing and publication of her book in USA (My Life in Doha, Between Dream and Reality) as indicated in his letter [Figure 3]. Rachel and Dr. Loop share the same hobby of growing orchids. I appreciate your concern and moreover, I thoroughly enjoyed reading your reminiscences. Your poems are thoughtful and timely. I keep you advised about my progress -- except for some complications related to chemotherapy, I am doing well and my spirits are high. Please give my best regards to Rachel. At the time of his retirement as CEO, Dr. Loop summed up his career at Cleveland Clinic in this way: "We're all here to do the best possible job, and that's what I tried to do. I think I leave it better than I found it." No one doubt that he did indeed. "We are deeply saddened by the loss of Dr. Floyd Loop, our friend, colleague, and past chief executive officer of Cleveland Clinic. As a cardiac surgeon and physician leader, his contributions to medicine and to the growth of Cleveland Clinic will be remembered forever. Our thoughts are with his family and friends during this difficult time". Steve Goldstein: Health+Medicine A biannual publication of the GW School of Medicine and Health Sciences,http://www.gwmedicinehealth.com/spring-2013/prestigious-career/. Cleveland clinic: Consult QD—Heart and Vascular, NEWS and INSIGHT, Jun. 19, 2015.